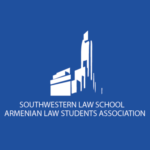 The Armenian Law Students Association (ALSA) at Southwestern Law School was formed to provide a forum for discussion, networking and opportunities for both academic and professional advancement. By offering a supportive and social atmosphere, ALSA intends to further the development of attorneys of Armenian heritage into the American legal system. Further, ALSA members work closely with the administration and the Armenian Bar Association to prepare the next generation of responsible attorneys, who excel academically, succeed professionally, and positively impact the community. Please visit the websites below for more information on ALSA at Southwestern Law School or for pictures and event info. You can contact a student representative at Southwestern by email at alsaswlaw@gmail.com. Please join the group for more information. Thank you!